The first-ever winner of the Overwatch League season playoffs is the London Spitfire. After a rocky season spent wobbling between commanding victories and unexpected defeats, the Spitfire earned a $1,000,000 prize, as well as a silver gauntlet in the style of publisher Blizzard’s sword-and-sorcery roots. Their underdog opponents, the crowd-favorite Philadelphia Fusion, retreated with the number two title and what looked like a whole lot of heartache. The sold-out 19,000-seat basketball arena, more accustomed to high tops and high heels than cosplay, rocked with screams throughout its two days of games. Fans traveled from all over to attend the five-month season’s final game—among them rockstar Jon Bon Jovi, Brooklyn Nets player D’Angelo Russell, and actress Courtney Miller. 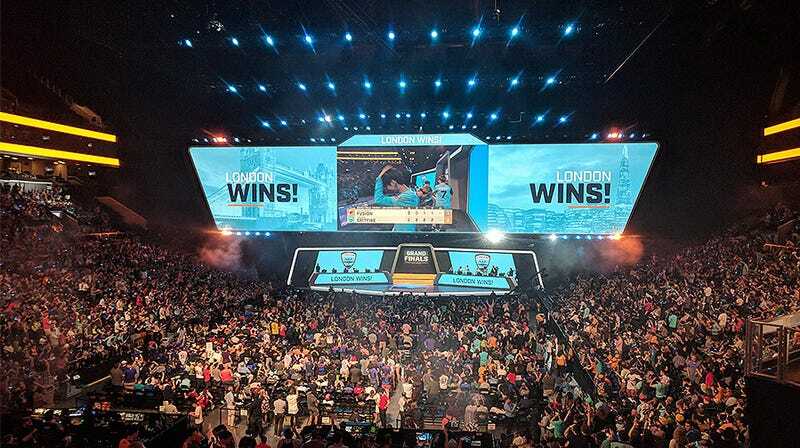 Compared to the Overwatch League’s Burbank, California home stadium, which can accommodate just 450 spectators, this was the big-time. Backflips from the perky Brooklynettes dance troupe reminded the crowd of gamers that they were enjoying a branded sports experience. They watched with mild interest. DJ and Snapchat celebrity DJ Khaled opened today’s game with his trademark hypeman fare. The first few times he paused mid-song for fans to scream-shot lyrics, Khaled was met with silence. By the middle of his set, fans were dancing in the aisles. The pomp and circumstance befit the $20 million team buy-in for the League’s first season. Viewers of the League’s ESPN airing seemed a little more skeptical; Twitter comments under ESPN’s Overwatch coverage argued vehemently that it’s not a sport. Yet this weekend’s event certainly proved to Blizzard and the world that the Overwatch League could pack regionally-branded, brick-and-mortar stadiums—a hope Blizzard has expressed many times over for the League’s future. Fans even briefly did the wave. Amid furious clapping and banging thundersticks, boos greeted the London Spitfire as they entered the New York City’s Barclays Center. Neither underdogs, guaranteed winners, or local favorites, the Spitfire outplayed Philadelphia’s scrappy boys with a decisive 3-0 sweep today and an easy 3-1 yesterday. They embodied calm coordination in nearly every moment on screen. The performance was symphonic, with each instrument performing as desired exactly on cue. Yet skill didn’t make up for many fans’ disappointment over the Fusion’s loss. Casters had predicted that the strength of London’s tank and support heroes would outweigh the force of Philadelphia’s terrifying famous damage-dealers, Jae-Hyeok “Carpe” Lee and Josue “Eqo” Corona. Known as an emotional and streaky team, the Fusion’s more inconsistent side showed these two days of finals. London’s damage-dealers Ji-Hyeok “Birdring” Kim and Jun-Young “Profit” Park were left unchecked. Carpe faltered, and was utterly unable to escape pressure and focus fire. And although Fusion players like Alberto “Neptuno” Gonzales Molinillo (on support) and Gael “Poko” Gouzerch (on tank) pulled off astounding plays, the team wasn’t able to consistently follow up on these short moments of success. On the Spitfire’s end, Gesture always smelled Fusion players’ blood in the water and clean up after Birdring and Profit’s massacres. After today’s match, Profit said, in one word, winning felt “indescribable.” The players hope for a New York steak dinner to celebrate. Between Philadelphia and London fans, New York Excelsior stans packed the Barclays center. Throughout the season, they dominated with a 34-6 record, 10 games better than both London and Philadelphia and were considered shoe-ins for today’s game. Not so. Several attendees interviewed outside the arena admitted they’re purchased their tickets in anticipation of the New York Excelsior making the New York finals. A sea of Excelsior-styled jerseys and flat-brim hats greeted Excelsior players on their “homecoming” journey, complete with a pop-up store, where they sold t-shirts designed by a brand ironically called Undefeated. The inaugural season champions beamed as they stood up from their computers. Coach Cheol-yong “Agape” Hong burst into tears as the Spitfire was poised to accept Blizzard’s trophy. The event was a success. As for the season—we’l find out as plans for the next are made. After a well-deserved break, the Overwatch League’s second incarnation will look a little different, with rumored new teams from Paris and Guangzhou, China. There will be new winners, new crowd favorites and an ever-changing game to contend with.